Hello Pretty Providence readers! 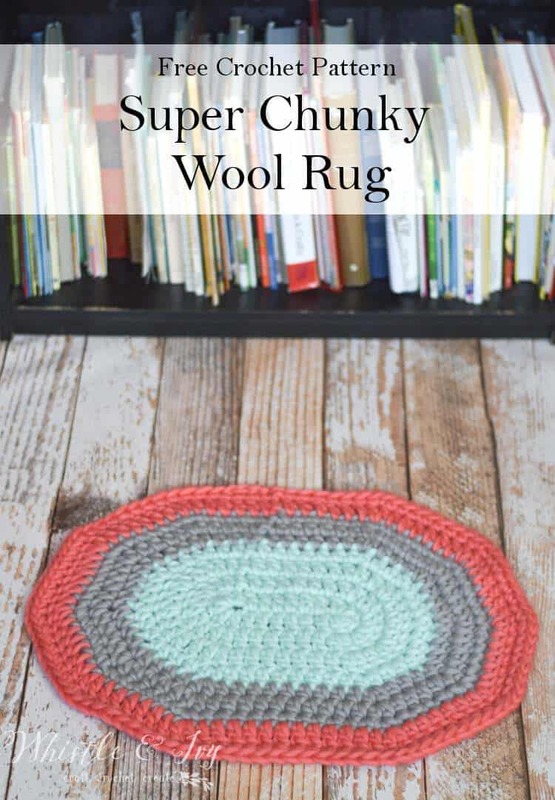 I am Bethany from Whistle and Ivy, and I am so excited to share this Super Chunky Oval Rug Crochet Pattern with you today. This pattern is fun and simple! I don’t know about you, but I love working with chunky yarn. 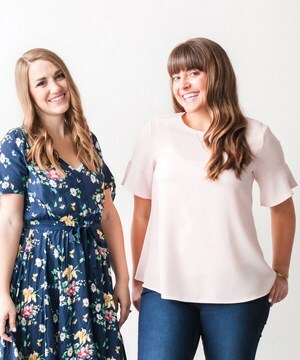 It makes for some super quick projects with a beautiful, bulky texture. The colors in the rug are so pretty! 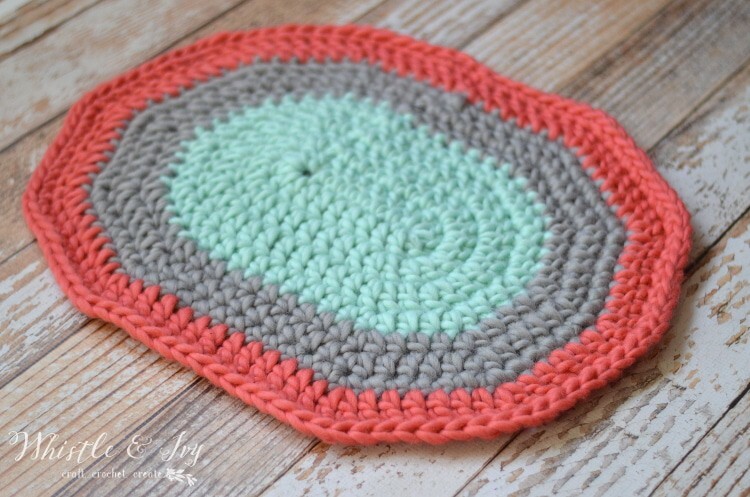 This would be a super cute accessory to a baby room, or a comfy and colorful bathroom rug as well. Although the pattern is simple, I do change the type of stitches for a few of the rows, and the reason for this is to maximize the yarn length, and avoid buying more than you need. Bulkier yarn comes with less yardage then medium weight yarn, so when I didn’t have enough to crochet the full round in a larger stitch, I made the last round of a certain color in a smaller stitch. Note: To make the color changes more seamless, finish the last stitch of the round with the color you intend to start. For instance, if your last stitch was a dc, you will work all the steps of a dc stitch, but finish the stitch by grabbing your second color and pulling it through for the last step, then join with a sl st using 2nd color, which you are now using. This in optional, but definitely makes the seam look nicer. 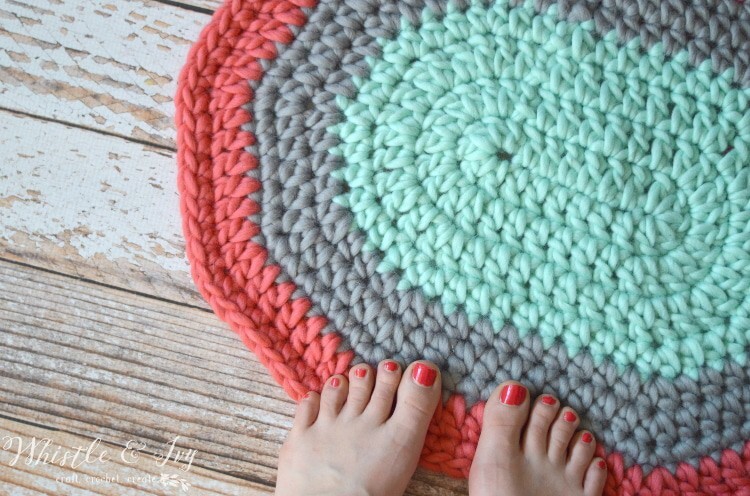 I hope your toes enjoy your new fabulously cozy Super Chunky Oval Rug! For more crochet awesomeness, subscribe to Whistle and Ivy here, and find me on Facebook and Instagram. I really want to MAKe this crocheted rug, however I need a visual since I can’t read the pattern due to dyslexia. There are lot if ppl like me. Hey Jeanna! I wish we could help you out with a visual tutorial. Have you searched for this type of thing on YouTube? I need help I started crocheting this rug with regular yarn, but when I get passed row 4 it starts curling up what can I do to make it lay flat?